Have you have heard the word “Shambhala” for the first time and want to know what it means? Are you looking for meditation instruction? Are you interested in Shambhala’s other mindfulness and contemplative arts programs? Are you seeking a community of like-minded people exploring the possibilities for creating enlightened society? Shambhala is a global community of people inspired by the principle that every human being has a fundamental nature of basic goodness. Click here to read more about our community and vision. Visit a Shambhala Centre or group to meet local meditation instructors who can guide you in the practice of meditation, and community members who can introduce you to the wide variety of other programs and activities our community offers. Most centres and groups offer a weekly or monthly open house as well as introductory programs throughout the year. There are a lot of ways to connect with Shambhala virtually! There are a number of excellent books for getting started listed on the Learn to Meditate page. Does Shambhala have programs for children and young adults? Where can I read about the activities of the Shambhala community and its members? 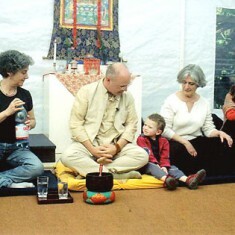 Meditation instruction is offered by qualified meditation instructors at all Shambhala Centres, and many of our groups. You can find the nearest Centre or group on our world map of Shambhala locations. If you are not near a centre or would like to start online, you can take a short introductory course through Shambhala Online. Once you get an introduction to meditation, you will likely have questions or want guidance in your practice; this is the value of working with a meditation instructor. For a more detailed presentation, please see this introduction to meditation. Within the vast teachings of the buddhist tradition, Shambhala holds a distinctive place. The Shambhala teachings flow from the original transmission of the Kalachakra (Wheel of Time) tantra, said to have been transmitted by the Buddha to the first sovereign of Shambhala, King Dawa Sangpo. In its contemporary form, this body of wisdom is referred to as the teachings on enlightened society. If you would like an introduction to the Shambhala teachings, among the most popular books to read are: Shambhala: the Sacred Path of the Warrior (by Chögyam Trungpa Rinpoche) and The Shambhala Principle (by Sakyong Mipham Rinpoche). To find the nearest Shambhala Centre or group, please visit our world map of Shambhala locations. Shambhala welcomes everyone. 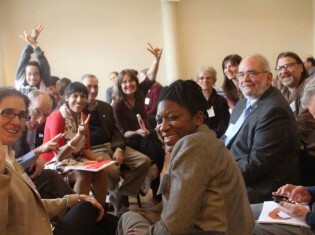 We are working towards developing a community of diverse ethnic, socio-economic, sexual and other backgrounds. We endeavour to provide environments that are accessible to people with disabilities. Most programs and events are open to everyone; however, some advanced programs require prior authorization to ensure that participants have received the relevant preparatory instruction. Many of our local centres, groups and retreat centres have programs and activities for children, families and young adults. For details, please check our world map of Shambhala locations. Where can I learn more about the activities of the Shambhala community and its members? 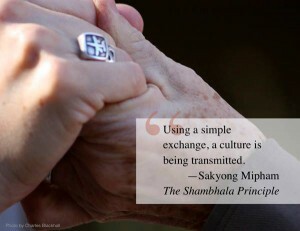 The most current and lively way to connect with the activities of the Shambhala community is to read our daily Shambhala Times. It is our online community news magazine with features from community members and news about activities worldwide. If there is a Shambhala Centre or group near you, feel free to attend an open house or introductory program, or contact them for further information.